If you live in the Netherlands long enough, and if you have kids, chances are that at some point you’ll consider buying a bakfiets or Dutch-style cargo bike. Kids riding in a typical Dutch bakfiets. Image by Josep Capdevila, CC BY-NC-SA. They’re incredibly handy for carting kids and shopping around the city and, for car-free families, they’re an almost essential accessory. Since expats often ask about which bakfiets is the best, or how to choose one, and since many reviews are only available in Dutch, here’s Part 1 of our Buyer’s Guide. The advice below comes from our own knowledge of bicycles (we biked around the world from 2006-2009) and research we did while considering the purchase of a bakfiets ourselves. 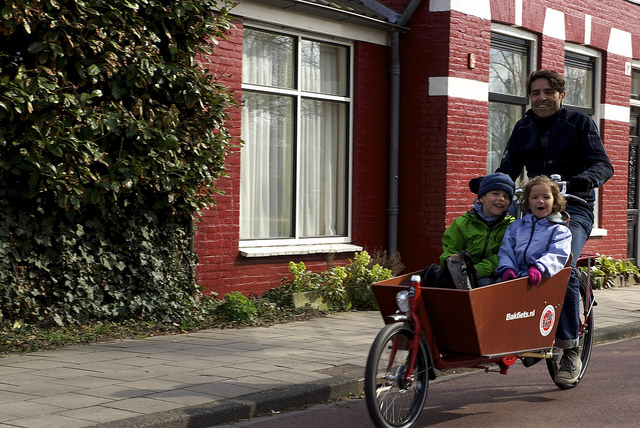 The electric Urban Arrow Family bakfiets has been rated as one of the best. Most people we’ve talked to say that, budget permitting, they would prefer a bakfiets with a battery. These are HEAVY bicycles, weighing about 50kg empty. It’s perfectly feasible to pedal one on without electric support on relatively flat paths but you’ll appreciate the extra push of the battery when you’re hauling more than one kid, a lot of shopping or pedalling uphill into a headwind. Battery support also makes it feasible to use your bakfiets over longer distances. This support comes at an extra cost. Expect to pay €1,000-1,500 above the cost of non-electric models. You’ll probably also need to buy new. Most second-hand bakfietsen advertised on websites like Marktplaats are the non-electric variety. The battery should be easily removable so that it can be recharged separately. Most models are built this way but double check before you buy. Find out how powerful the motor is. Not all bakfietsen batteries are the same. The weaker ones may not be enough to power you up any hills (eg. if you’re going through the sand dunes along the North Sea coast). Ask if the motor is configured for walking support (loophulp) as well as cycling support, for example when you are leaving an underground bike parking and need to push the bike instead of pedalling it. Many motors only kick in while you’re pedalling. Be aware that motors can also vary in their loudness: some are nearly silent and others are remarkably loud. Of course, it’s perfectly feasible to get a bakfiets without a battery and you’ll be in fantastic shape after a few months of pedalling around town! Just be aware that pedalling an ordinary bakfiets could be a little challenging in certain conditions (headwinds, hills, etc…). Many people initially assume that a three-wheeled bakfiets will be more stable than a two-wheeled one but this isn’t true. A bakfiets with two wheels is generally easier to ride than three-wheeled models. This is especially noticeable on cobbled or bumpy roads, when a three-wheeled bakfiets can slant a little to reflect the uneven riding surface. With a two-wheeled model, you respond to the uneven surface better by adjusting your riding position. When deciding between two or three wheels your first consideration should be how many kids you want to carry. A two-wheeled bakfiets is slightly smaller and is therefore best for no more than 3 children. Of course, you can always put an extra child in a seat on the back (fixed to the luggage rack). A two-wheeled bakfiets is also easier to handle over longer distances because it tends to be lighter compared to three-wheeled models. Finally, it’s more compact, which makes it easier to park. Choose a three-wheel model if you think you’ll need to carry 4 or more kids, or if you plan to regularly carry a lot of shopping home. Most people ultimately choose a two-wheeled model. TIP: If you choose a two-wheeled model, make sure it has a good, easy-to-use kickstand. You’ll need this when loading and unloading the bike. The Babboe City bakfiets is one of the most affordable models available. As you research bakfietsen, you’ll notice a wide range of prices. Babboe models start under €1,000 while the electric models of the stylish Urban Arrow bikes sell for over €3,000. What accounts for this? Quality. 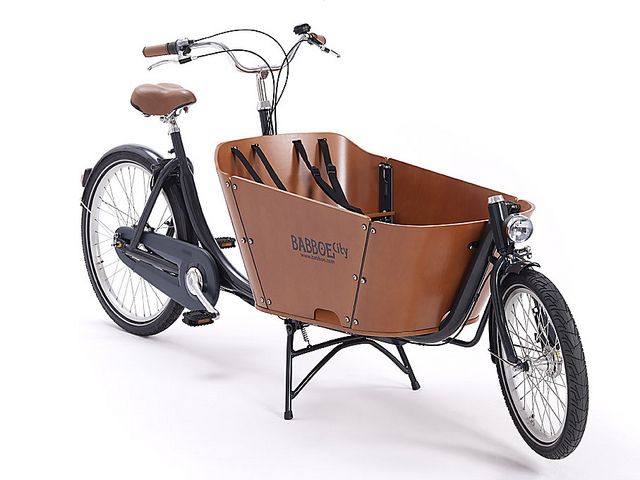 The list of specifications on cheaper and more expensive bakfietsen can seem similar but look closely you’ll find the material used for the front basket, the kickstand, the paint finish and other elements of the bakfiets are of lesser quality than the materials used on more expensive models. This has an influence on how long the bakfiets will last before you’ll need to take it in for (potentially expensive) repairs. Durability. Cheaper bakfietsen aren’t designed to be kept in the rain and wind outside. If you purchase one and don’t have a shed or other inside area for it, you’ll need to cover it if you want it to last. Special “bakfiets pyjamas” are sold for this purpose. More expensive models can easily withstand rain and wind. Options. Cheaper models may only be available in one colour or may not have as many options for customisation. Customer service. Some cheaper bakfiets brands are mainly sold online and this makes it difficult to arrange a test ride. Also, consider what will happen if you need your bakfiets fixed or if you have a complaint. Is there a person you can contact (not just a generic number) or a shop you can visit? Electric or not? 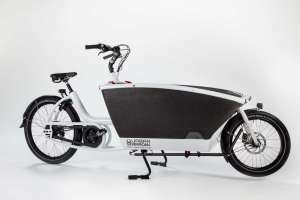 The luxury of electric support will add €1,000-1,500 to the cost of the bike. Overall weight. A Babboe City bakfiets weighs about 60kg compared to 40-45kg for lighter, more expensive brands. In Part 2 of this series, we discuss specific models and the pros and cons of each.